Mumbai, May 14 (IANS) Renowned Islamic scholar, progressive thinker, author and Dawoodi Bohra reformist leader Asghar Ali Engineer passed away here Tuesday after a prolonged illness, family members said. He was 74. Engineer, a widower, is survived his son Irfaan and daughter Seema Indorewala. He was ailing for several months and breathed his last at his Santacruz East home around 8 a.m. The funeral is likely to be held Wednesday, Irfaan indicated. Born in Salumbar, Rajasthan, in a Dawoodi Bohra Amil (priest) family March 10, 1939, Engineer acquired his training in Quranic tafsir (commentary), tawil (hidden interpretations of Quran), fiqh (jurisprudence) and hadith (Prophet’s teachings, sayings) during his early days. His father, Sheikh Qurban Husain, was the Amil who also taught the young Engineer Arabic. Later, Engineer studied all the major religious works and scriptures by eminent scholars. He graduated as a civil engineer from Indore, Madhya Pradesh, and went on to work for nearly two decades in the BrihanMumbai Municipal Corporation (BMC). In the early 1970s, he sought voluntary retirement from his BMC service and plunged into the reformist movement in the miniscule Dawood Bohra community, estimated at around 1.20 million worldwide. In 1972, he assumed a leading role in the movement from Udaipur and also mobilised national and international public opinion through media articles and speeches. In 1977, he was elected general secretary of Central Board of Dawoodi Bohra Community at its maiden conference in Udaipur and guided the reformist movement. Later, Engineer devoted his time and energies to work for communal harmony and combat communalist forces in the country. The recipient of several awards and honours from around the world, Engineer travelled across the globe speaking at international conferences, seminars and universities on Islam, peace, human rights and other issues. 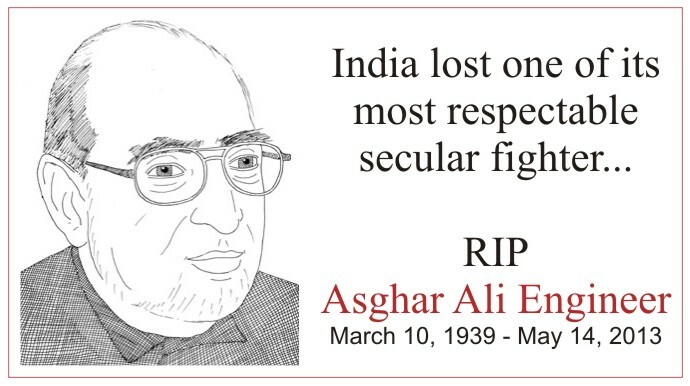 He founded the Institute of Islamic Studies (1980) and the Centre for Study of Society and Secularism (1993), and also authored around 50 books on various topics and believed in treating all religions with equality. According to reformists, Engineer never believed in blind acceptance of dogmas inherited from the past but strived to rethink issues and reinterpret Islam in keeping with modern times. Asghar Ali Engineer, leader of the Progressive Dawoodi Borah movement speaks to Madhu Trehan on how priestly families in the community are distorting Islam, challenging fatwas, how Satanic Verses should be challenged but not banned & more.